Most of my grocery shopping is complete, but I do have a few things to pick up next week. Turkey and ham will be at their lowest price the week of Thanksgiving – so I’m waiting until then to pick up my turkey breast. I’m really excited to serve this menu next week. Except for the ham and desserts, it’s pretty different from the menu I served two years ago. Do you like to have the same thing every year, or do you prefer variety at Thanksgiving? 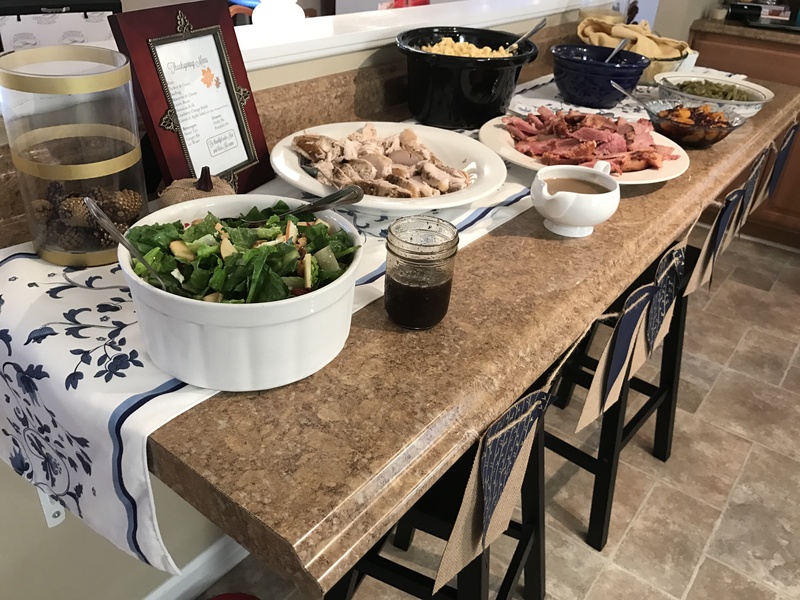 Usually, our meal is the same every year: My aunt and uncle serve turkey, mashed potatoes/gravy, stuffing, grandma’s cranberry fluff dessert (a family recipe, as she’s not been with us for years), green bean casserole, corn, and pumpkin pie. There’s usually a mixture of sides/snacking things that randomly show up, too. 🙂 I’ve been dreaming about the meal, as we didn’t get it last year due to snowy/icy roads. There’s a chance of precip this year, too, so keeping the fingers crossed that we make it! Do you have access to Meijer? They have their turkeys half off this week! Yummy!! 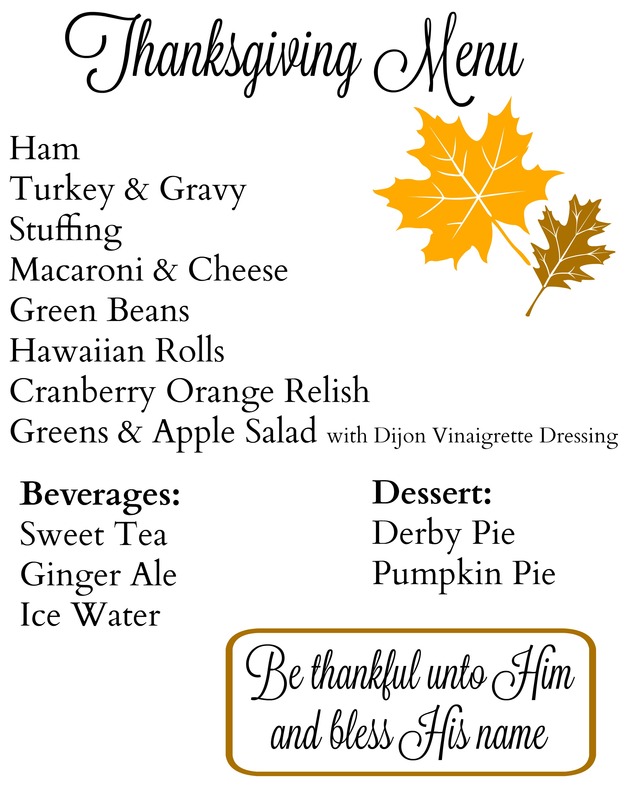 No one ever serves mac and cheese at our Thanksgiving gatherings so I would love to see that on our menu. Your guests are lucky to have such a delicious spread!! I always fix a mini Thanksgiving meal for my little family the week following Thanksgiving. I need to pick up my turkey this week so I’m prepared. 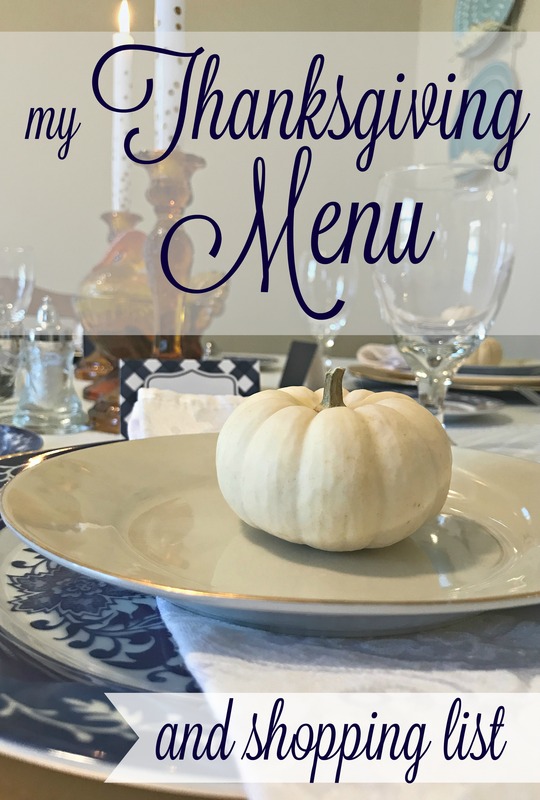 I love that you make a separate meal just for your family – that’s such a special tradition! We’ve never had mac and cheese either, but I just thought it would be really good instead of mashed potatoes. We always eat with either my parents or John’s (we alternate years, based on when John’s brother & sis-in-law come down from Boston). Our menu stays mostly the same year to year. But for me it’s not Thanksgiving without my mom’s cornbread dressing! It’s my favorite thing, followed by pumpkin pie with lots of whipped cream. I love cornbread dressing! Every year Paul reminds me that stuffing should not have celery or anything other than bread in it. LOL. Love your menu! We tend to always have the same things. I’ve thought about switching it up but I have a feeling there would be disappointment. We have so many starches trying to get everyone’s favorites….mashed potatoes, sweet potatoes, dressing! Lots of things for that gravy to go on. Can you share your recipe for gravy please? I struggle using the giblets…they are just eeewwwww to me! How many guests are you expecting? I’m only interested in the starches at Thanksgiving! 🙂 I’m using my normal gravy method with the turkey drippings (search “how to make gravy” on the blog to find that recipe), but I also have a packet of brown gravy to mix up for the ham. It’s what Paul likes. 🙂 I will have 5 guests for sure – could be more but not more than 8.